There's no wrong time to eat a Starburst fruit chew, apparently. 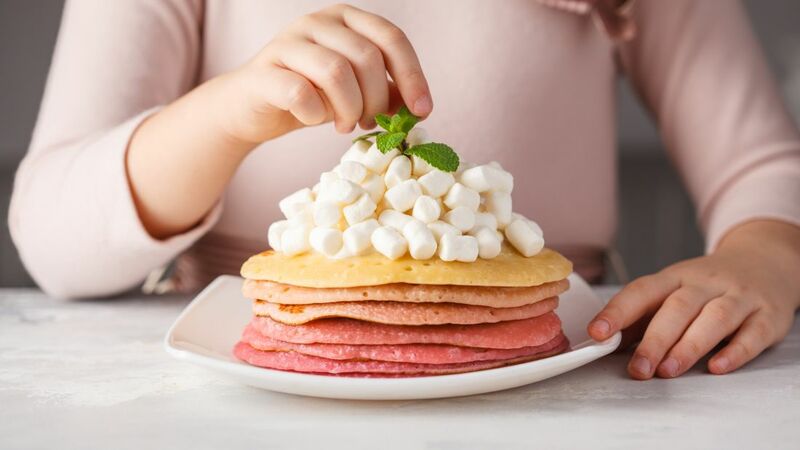 The bright candies are perfect for dessert, a mid-afternoon snack, and—after dressing them up with this easy pancake recipe—a playful breakfast. To make the colorful meal, unwrap and separate the Starbursts into red, orange, yellow, and pink piles. Then melt each color separately over the stove with milk and heavy cream. Pour the liquid Starburst mixtures into four separate bowls, then stir pancake mix into each until you have four bowls of yellow, orange, red, and pink pancake batter. Add a few drops of food coloring into the corresponding bowls to make the hues even more vibrant. From there, cook the pancakes on a greased skillet as you normally would, flipping them after a minute or two. When they're fluffy and slightly brown on both sides, remove them from the griddle and, if the 80 Starbursts aren't enough to satisfy your sweet tooth, top with syrup. You can follow the recipe step-by-step in the video below, and then check out our suggestions of more ways to use excess candy.